The first card was created using Certainly Celery card stock, ribbon and brad. The flower in the focal image was inked with Barely Banana and wording around the image was inked with celery. The circle was attached to the card with a dimensional. The second card consists of Pretty In Pink cardstock for the base and Perfect Plum ink and card stock for the layered pieces. The last card is on a white base with a layer of Pretty In Pink and then the patterned paper. You'll noticed I used one of my absolute favorite stamp sets (I Like it a Latte). I punched out a flower using the Spring Bouquet Flower punch and added a Swarovski Crystal (love the bling). The Square Mega Scallop punch by is Marvy Uchida. All other card stock, ink, images, accessories and punches are @Stampin' Up. I am not a scrap-booker (at least not yet). I don't usually use patterned paper on my cards but I had purchased a sample pack of Stampin' Up paper on Ebay a few years ago before I signed on as a demo. The paper was 12 inches square and the woman was selling one 6 inch square of each pattern (36 or 40 patterns total I believe). I've only used the paper a few time so I decided to play around with it over the weekend and attempt to incorporate it into some new creations. I don't often use the Only Orange card stock unless it's for Halloween as it is a little bright for my liking. Since orange is one of the colors in the patterned paper, however, I decided to use it along with Green Galore. I was pleased with the end result. I didn't make this card with anyone particular in mind but I believe I will have to give it to a coworker who absolutely loves orange. All card stock, ink, images and ribbon are @Stampin' Up. Mega square scalloped punch by Marvy Uchida. Small rose Swarovski flat-back crystal from Wedding Cuts. I created several more cards featuring patterned paper, however, I was not successful in photographing them tonight. The colors just weren't showing true so I'll have to try other lighting options (or maybe I need a new digital camera...what do you think, Bill). Since it's getting late, I need to end here. Wow. It was 83 degrees today. We opened all of the windows and it felt so good. Greta loves sitting in the window and listening to the birds. I love the fresh spring air. We ate at Charlie Gitto's at Harrah's Friday night. The Chicken Nunzio was spectacular. It is chicken breast topped with crab meat and provel...Yummo! We ordered the chocolate moose cake for dessert. It was huge! Seriously, it was enough for 6 people. Actually, it was pure moose, no cake...delicious. After dinner, we played the slot machines. Bill lost $20 and I won $19 so I guess that's a net of -$1. We're such big gamblers...hee hee hee. I created quite a few cards this weekend. This is a particular favorite of mine. I used the flower stamp from the Polka Dots & Paisley set for the focal image and Linen for the background. A chrysolite Swarovski crystal was added for a little sparkle. All card stock, ink, ribbon and images are @Stampin' Up. Scallop punch by Marvy Uchida. There is a woman on the Splitcoast Stampers website whose husband is currently serving in Iraq. She posted a message asking if anyone would be willing to send cards to her so that she could send them to the base where her husband is stationed. The troops can then choose cards to send back home to their loved ones for birthdays, anniversaries, holidays, etc. She calls it "Operation Greeting Card." I think this is an excellent idea and, since I always have more cards than I can use, I decided to send some to her. I chose an assortment that covers just about any occasion. All card stock, ink, stamps and accessories are @Stampin' Up. Just my small way of showing support for the troops. God bless them all. Today is the first day of spring...whoohoo! Well, it officially starts in about 30 minutes but the calendar says this is the first day of spring. I'm so happy. I love spring. I even created a card in honor of the change in season. The inside of the card says, "spring" which I created using my beloved Cricut. I used Cameo Coral and So Saffron card stock for the base. I stamped the flower image in Ballet Blue and layered it on a piece of Ballet Blue card stock. The flower stamp and dotted background are from the Polka Dots and Paisleys set. All stamps, ink and card stock are @Stampin' Up. The Ribbon is from May Arts. I guess that's why I haven't posted since Monday. Tuesday evening, I scanned all of my recent creations. I scan all of the cards I make in order to keep a record of them. This doesn't sounds like it would be very time consuming but it is. Sometimes it takes two or three tries to get a good scan especially if there is ribbon or something "bumpy" on the card. Wednesday evening, I photographed some of the creations that I plan on posting on my blog. This is even more time consuming because it's difficult to get the lighting just right so that the colors show true. Thursday evening I went to happy hour with Thelma. Friday evening, Bill and I ate at Blueberry Hill...yummy fried cheddar cheese balls, great hamburgers (mine had blue cheese and bacon) and a pitcher of Schlafly's current seasonal, Scotch Ale. Last night was Sarah's birthday party. Her birthday was Friday and she turned nine. It seems like just yesterday she was a baby. This is the birthday card I made for Sarah. Since she loves yellow, I decided to make the main color Yoyo Yellow. This can be a difficult color to use because it is so bold and not many colors can stand up to it. I decided to pair it with Orchid Opulence and it seems to be a good balance. I recently ordered some flat-back Swarovski crystals in various colors. It's difficult to see in this photo but I added a purple crystal to the center of the flower. All card stock, ink, images and white ribbon are @Stampin' Up. Purple ribbon is from an unknown source. 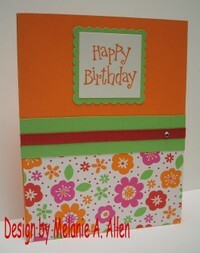 Background was embossed with the Cuttlebug Happy Birthday embossing folder. The temperatures are colder once again. After a high of 78 on Wednesday, we went back to highs in the 40's Thursday, Friday ad yesterday. It actually snowed yesterday. The snowflakes were huge...almost as big as hamsters! Hee hee hee. The snow didn't stick to anything but the trees. It was 52 degrees today and there's supposed to be another warm-up starting on Tuesday with highs in the 60's and 70's for the foreseeable future. Woohoo! Hopefully this means that snow is in the rear view mirror! My best friend, Thelma, is going to Vegas with her best friend, Louise, in October. Sounds like a lot of fun! Thelma has never been to Vegas so Louise is going to be sure to show her the sights. A beer or two at the Monte Carlo Brew Pub and a stop at M&M World are definitely on their list. Thelma also might try riding the roller coaster at New York, New York, but Louise suffers from motion sickness and doesn't handle that kind of ride very well. Naturally, I had to make a card for the occasion. I bought this "time to party" stamp at Michael's specifically for this card. 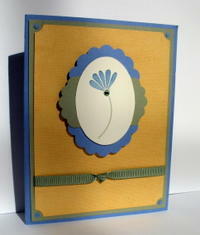 I used the Cuttlebug swirl embossing folder for the background and one of the flower dies and ribbon slide dies. I used the Cricut to cut out the words, "Vegas Baby" for the inside of the card. Be sure to click on the photo for a better view. Wow! This was a great weekend. First of all, the weather was wonderful. The weatherman had said that it was going to be cloudy all weekend but, once again, he was wrong. It was sunny and in the 60's both days! I hooked up the hose and rinsed off the front porch and the back patio on Saturday. It was so nice to wash away the winter grime. I also washed my car and it is now once again a pretty metallic silver rather than a dull tarnished nickel. We cleaned up the yard today, raking up all of the dead leaves and branches. The lillies, iris, tulips, jonquils, hostas, roses and hyacinths are all starting to grow. The trees have buds and the grass is starting to turn green. Woohoo...spring! I love it. Another reason why this was a good weekend is because we turned the clocks ahead one hour. I'm convinced that I have a mild case of seasonal affective disorder. The older I get, the more I hate winter. I hate when it gets dark so early...I hate cold...I hate snow. I jump for joy once March arrives and Spring is on the horizon. I made several cards this weekend...Easter, Mother's Day, Thelma's birthday. I bought some Swarovski crystals last week so, of course, I had to incorporate them into my latest designs. There's nothing better than a card with bling! Mynee's Musings is one year old today! Woohoo. You can click here to read the first post I entered on March 6, 2006. In honor of this monumental occasion, I'm posting two of my recent creations. The first one was made using the Cuttlebug Bloom Dots embossing folder. I bought it because it just looks like it was made to go with my Seeing Spots stamp set which is what I used on this card. I used three of the new "In Colors" - Marigold Morning, Cranberry Crisp and Cool Caribbean. I also added a little Certainly Celery for one of the flowers and dots as well as the ribbon. 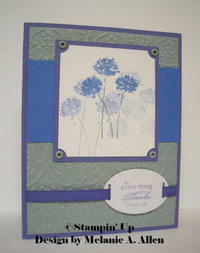 This second card was created using one of my new favorite color combinations; Sage Shadow, Lovely Lilac and Ballet Blue. 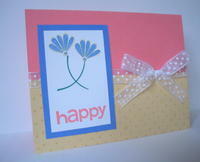 I used the Cuttlebug Textile embossing folder for the background and the flower from Happy Harmony for the focal image. The ribbon slide was created by cutting a piece of chipboard (think cardboard the thickness of a cereal box) using one of the Cuttlebug dies. Thank you to all of my loyal readers. I hope you stick around for another year! I never get tired of talking (or typing as the case may be) and I definitely have a lot more things to say and share.